The Fed — deer in the headlights? When they walked into the meeting on Wednesday, Sept. 16, it is likely that the FOMC members (Federal Open Market Committee, the rate-setting committee of the Fed) did not know the interest rate decision they would make on Thursday. We had Jeff Lacker (Richmond Fed), Dennis Lockhart (Atlanta Fed), and John C. Williams (SF Fed) all saying recently that they thought that interest rates should rise before year end. You had the IMF and the World Bank saying not to raise rates, while the Bank for International Settlements said that the Fed should not to pay attention to the IMF or World Bank. You had Wall Street going from 50 percent certainty for a September raise a month ago to 25 percent certainty early in the week. The decision of the FOMC on Thursday was not to raise rates (the only dissent was from Lacker). In the last 20 years, the Fed has rarely hiked interest rates without sending a lot of signals to the market of its intent, and rarely moves unless market expectations indicate a 70 percent probability. 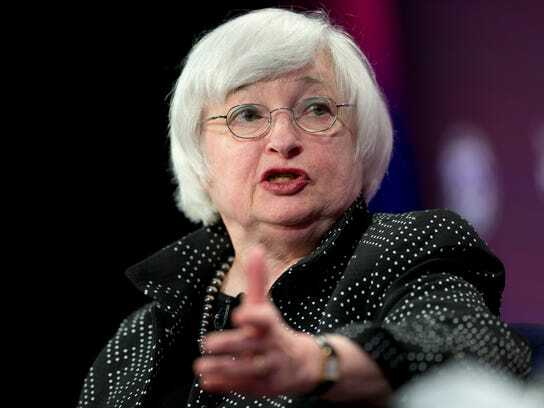 In her post-meeting press conference, Yellen indicated that inflation is not yet high enough. So a move up in inflation, which looks to be some time off, is a crucial variable. In addition, she indicated that the path of projected rate hikes over time, and their magnitude, was more important than the timing of the first hike. That path has a low trajectory, and the FOMC participants lowered that trajectory once again at this meeting. Finally, she indicated that the FOMC was worried about the condition of foreign markets (i.e., China), unusual for the Fed (because it’s not in its stated mandate). As indicated above, China’s growth slowdown is unlikely to have any great impact on the U.S. economy. The consensus is that Yellen gave little forward guidance and left uncertainty intact. Market reaction, so far, has confirmed this view. Ask yourself: Is a raise in October, based on her testimony, really a possibility? What is likely to change between now and then? – certainly not inflation – and there won’t be a significant change in the direction of foreign economies. In my view, the conditions Yellen set for a rate hike (inflation and foreign market considerations) are unlikely to be met this year, and maybe not until the middle of next year (if even then). Nevertheless, Fed credibility is low and Yellen and the Fed can change what they view as important at the drop of a hat. The Fed is now seen as a “deer in the headlights.” Lack of credibility just reinforces the uncertainty and market volatility. So, what should an investor do? The U.S. economy, while it has issues in the industrial sector, is still basically sound. The last time the Fed was spooked by events in the international economy was in 1998 with the Asian meltdown. At that time, the U.S. economy was hot with the dot-com bubble. In the 21 months following that “deer in the headlights” reaction, the S&P 500 rose 29 percent, and all of the European major bourses were up a similar amount. Just an observation. Robert Barone, Ph.D., is an advisor representative of Concert Wealth Management, Inc. and an employee of Universal Value Advisors, a NV LLC. Advisory services are offered through Concert Wealth Management, Inc., a registered investment advisor. Robert is available to discuss client investment needs. Call him at (775) 284-7778. Statistics and other information have been compiled from various sources. Universal Value Advisors believes the facts and information to be accurate and credible but makes no guarantee to the complete accuracy of this information. A more detailed description of Concert Wealth Management, its management and practices is contained in its “Firm Brochure” (Form ADV, Part 2A) which may be obtained by contacting UVA at: 9222 Prototype Dr., Reno, NV 89521. Ph: (775) 284-7778.